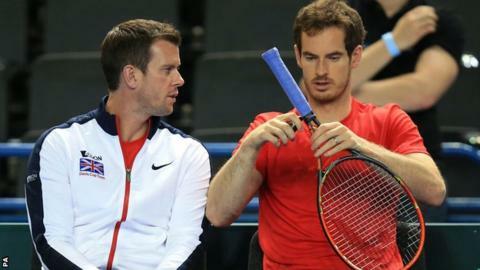 Andy Murray says he will play a full part in Great Britain's Davis Cup defence this year. Murray, 28, previously suggested that playing the whole competition would be tough in a congested summer that includes the Olympics. But before this weekend's first-round tie against Japan he said he would play in a quarter-final that falls between Wimbledon and the Rio Games. "That's the plan, but it's hypothetical just now," said the world number two. If Britain can get past Japan, who include world number six Kei Nishikori, they will face either Kazakhstan or world number one Novak Djokovic's Serbia. That tie would come a week after the Wimbledon final and a week before the Masters tournament in Toronto, which in turn ends six days before the Olympic competition gets under way in Rio. Immediately after that comes the Masters event in Cincinnati, which is the final major tournament before the US Open in New York. "Providing everything goes well, I would play in the Davis Cup, then have a little break and play Toronto and the Olympics, and potentially not play in Cincinnati," Murray told BBC Sport. "I've always enjoyed representing my country. Statistically I've played by far my best tennis when I've played for Great Britain." Meanwhile, GB captain Leon Smith said a back injury sustained by Kyle Edmund, who is likely to join Murray in playing the singles rubbers against Japan, will be assessed on Thursday. "We stopped the practice straight away because he has actually played a lot of tennis," said Smith. "The guys have had a look at it, but you have to wait and see how it calms down. "We will probably give it a run-out tomorrow before we make any final decisions." If Edmund is deemed unfit to start the tie on Friday, his place is likely to go to Dan Evans, who would be playing in front of a home crowd in Birmingham. Elsewhere, captain Lleyton Hewitt could come out of retirement to play for Australia in their tie against the United States. Hewitt, 35, called time on his career after the Australian Open in January, but is on stand-by if Nick Kyrgios and Bernard Tomic fail to recover from illness and injury respectively.